To evaluate the standard clinical outcomes, defocus curves, and satisfaction obtained with a new diffractive low addition trifocal intraocular lens (IOL). Thirty patients who were implanted with the Versario Multifocal 3F IOL (Valeant Med Sp.zo.o., Warsaw, Poland) were recruited for a prospective observational study at Qvision, Vithas Virgen del Mar Hospital, Almería, Spain. Variables for reporting standard outcomes were collected at the 1-month visit for monocular vision and the 3-month visit for binocular vision, including best spectacle refraction and corrected and uncorrected visual acuities at far, intermediate (67 cm), and near (40 cm) distances. 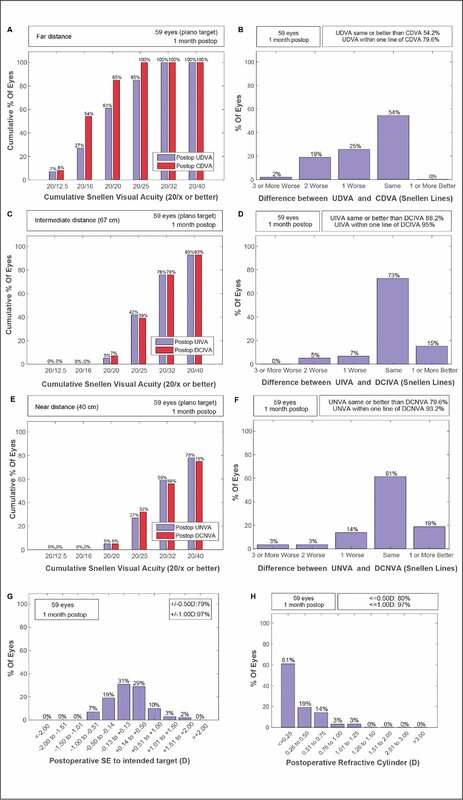 In addition, monocular and binocular visual acuity defocus curves were measured and questionnaires for grading subjective visual quality, satisfaction, and visual function were supplied at the end of the follow-up. Monocular corrected distance visual acuity decreased progressively from far (−0.05 logMAR) to near (0.25 logMAR) and improved approximately −0.1 logMAR along the defocus curve in binocular vision. The mean residual spherical equivalent (SE) was 0.15 ± 0.47 diopters (D), with 79% of eyes within ±0.50 D and 97% within ±1.00 D with the SRK/T formula. All of the visual function tasks improved after surgery, especially driving at night, which increased from 58 to 79 (P < .05). Of 27 patients, 84.4% were satisfied or very satisfied with their general vision. This new lens was similar in terms of visual performance and satisfaction to other trifocal IOLs. It can be classified as a trifocal extended depth of focus IOL because of the performance between extended depth of focus IOLs and medium-high addition trifocal IOLs. Trifocal intraocular lenses (IOLs) are the most popular option to improve vision at multiple distances after a cataract surgery procedure and an effective solution for refractive lens exchange.1 Trifocal IOLs can be classified according to their near addition at the IOL plane in low (+3.00 diopters [D]), medium (from +3.25 to +3.33 D), and high (+3.50 D) addition, having the intermediate focus between far and near2–4 or more proximal to the near focus.5 Although clinical results with medium2,5–14 and high2–4,8,15–17 addition trifocal IOLs have been widely reported, as far as we know, there is only one study published with low addition trifocal IOLs.18 The results of the previously cited studies usually followed the standard for reporting outcomes,19 which included the safety, efficacy, and predictability of the procedure. However, additional metrics are required for multifocal procedures such as visual acuity at multiple distances through proximal measurement or by means of defocus curves.20 The aim of this study was to report the standard outcomes, defocus curves, subjective evaluation of visual quality, and satisfaction obtained with a new low addition trifocal IOL. This prospective observational study was approved by the local ethics committee of research and adhered to the tenets of the Declaration of Helsinki. Thirty patients were informed about the study and provided informed consent to participate in it. Inclusion criteria were patients between 50 and 70 years old who underwent cataract surgery with either phacoemulsification or femtosecond laser cataract surgery, with the implantation of a Versario Multifocal 3F IOL (Valeant Med Sp.zo.o., Warsaw, Poland) (hereafter Versario3F). Exclusion criteria were patients with irregular preoperative astigmatism in either eye, preoperative regular corneal astigmatism higher than 1.00 D measured by corneal topography, intraoperative complications that could affect visual performance, previous intraocular or corneal surgery, abnormal pupillary dilation dynamics, active or recurrent anterior segment pathology, systemic or ocular medications that may affect vision, and diagnosis of dry eye. Three patients abandoned the study under their own initiative after completing the 1-month follow-up and one patient decided not to have surgery on the second eye during the course of the study. Therefore, the results included 29 patients (59 eyes) for the 1-month visit and 27 patients (54 eyes) for the binocular 3-month visit. The 1-month follow-up visit goal was the monocular visual performance measurement. 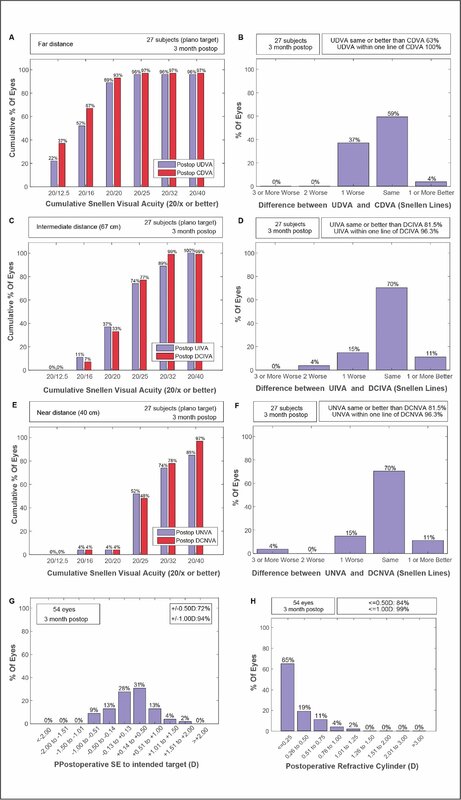 The best spectacle refraction was obtained at far distance and visual acuities, and the uncorrected (UDVA) and corrected (CDVA) distance visual acuities were obtained at far, intermediate (67 cm), and near (40 cm) with an iPad (Apple, Inc., Cupertino, CA) Early Treatment of Diabetic Retinopathy Study (ETDRS) chart (calibrated with a Spyder4Elite colorimeter; Datacolor Imaging Solutions, Lawrenceville, NJ) with a background luminance of approximately 250 cd/m2 (85% brightness), close to the recommended value of 200 cd/m2.21 Standard notation22 is used for reporting visual acuities: CDVA, UDVA, distance-corrected intermediate visual acuity (DCIVA), uncorrected intermediate visual acuity (UIVA), distance-corrected near visual acuity (DCNVA), and uncorrected near visual acuity (UNVA). The same iPad with the same background luminance was used to measure the visual acuity defocus curve for right eyes with the Multifocal Lens Analyzer4,23 at 2 meters, with a +0.50 D lens for correcting the vergence distance. Defocus lenses from +1.00 to −4.00 D in steps of +0.50 D were selected for measuring the visual acuity defocus curve with the best distance spectacle refraction. The same procedure was repeated at the 3-month visit for binocular vision. Finally, the Visual Function Index (VF-14) questionnaire24,25 and questions related to the grading of the quality of vision and satisfaction11 were taken by means of a five-level Likert scale. The Versario3F is a non-angulated plate-haptic IOL with 11 mm of total diameter and 360° posterior square edges. The material is hydrophilic (25% water content) with a hydrophobic surface and filters for blocking ultraviolet and violet light. The optic structure is diffractive with additions at the IOL plane of +3.00 D for near focus and +1.50 D for intermediate focus, and the aspheric surfaces lead to an induction of negative spherical aberration of −0.165 µm. The IOL power calculation was performed with the SRK/T equation considering the value of 118.6 for the A-constant. All surgeries were conducted by the same surgeon (JF) at Qvision (Department of Ophthalmology, Virgen del Mar Hospital, Almería, Spain) with phacoemulsification or femtosecond laser–assisted cataract surgery (Victus; Technolas Perfect Vision GmbH, Munich, Germany) through clear corneal incisions of 2.2 mm for manual incisions or 2.5 mm for laser incisions, both at temporal locations. All patients were treated postoperatively with 500 mg of oral levofloxacin, twice a day for 3 days; 250 mg of acetazolamide, three times a day for 1 day; 0.1% dexamethasone drops, 21 days decreasing from five, three, and one times a day for 7 days; 0.3% ofloxacin drops, five times a day for 5 days; and 0.9% bromfenac drops, twice a day for 1 month. Six eyes presented non-serious adverse events unrelated to the IOL during the surgery. Four eyes had pre-equatorial radial anterior capsule tears and two eyes had suction loss during the corneal incisions with the femtosecond laser procedure, for which the procedure was converted to manual incisions. All cases were included in the analysis because no decrease of visual acuity or increase of best spectacle refraction was present in comparison to the remaining sample after exploring distributions for possible outliers. The descriptive statistics for monocular distance uncorrected visual acuities at 1 month were 0.02 ± 0.11 (0 [0.2]), 0.19 ± 0.11 (0.2 [0.1]), and 0.24 ± 0.14 (0.2 [0.28]) logMAR for far, intermediate, and near, respectively. Monocular corrected visual acuities were −0.05 ± 0.09 (−0.1 [0.1]); 0.18 ± 0.10 (0.2 [0.1]), and 0.25 ± 0.16 (0.2 [0.2]) logMAR for distance, intermediate, and near, respectively. Significant differences were found between monocular UDVA and CDVA (z = −4.67, P < .0005) but not for the other distances (P > .05). Figure 1 shows the standard efficacy plots for monocular vision at far (Figures 1A–1B), intermediate (Figures 1C–1D), and near (Figures 1E–1F). Binocular vision descriptive statistics at 3 months were −0.11 ± 0.10 (−0.1 [0.2]), 0.09 ± 0.12 (0.1 [0.18]), and 0.19 ± 0.13 (0.1 [0.18]) logMAR for distance-corrected visual acuities at far, intermediate, and near, respectively. Uncorrected binocular visual acuities were −0.08 ± 0.10 (−0.1 [0.18]), 0.08 ± 0.09 (0.1 [0.1]), and 0.17 ± 0.10 (0.2 [0.1]) logMAR at far, intermediate, and near, respectively. Significant differences were found between binocular UDVA and CDVA (z = −2.71, P = .007) but not for the other distances (P > .05). Figure 2 shows the standard efficacy plots for binocular vision at far (Figures 2A–2B), intermediate (Figures 2C–2D), and near (Figures 2E–2F). The postoperative spherical equivalent was within ±0.50 D in 79% of the 59 measured eyes and within ±1.00 D in 97% at 1-month visit. The mean spherical equivalent was −0.03 ± 0.47 (0 [0.25]) D with non-significant differences in comparison to the spherical equivalent from the 54 eyes measured at 3 months, 0.00 ± 0.46 (0 [0.38]) D (z = 1.45, P = .15). The mean programmed target correction during the surgery was −0.18 ± 0.11 (−0.19 [0.25]) D. The standard predictability plot after correcting to the intended target is shown in Figure 1G for 1 month and Figure 2G for 3 months. Table 1 details the spherical equivalent corrected to the intended target for the total sample and stratified according to the preoperative axial length. One eye was not included in the stratification because it corresponded to a very long eye. The percentage of eyes with different levels of refractive astigmatism is shown in Figure 1H at 1 month and Figure 2H at 3 months. 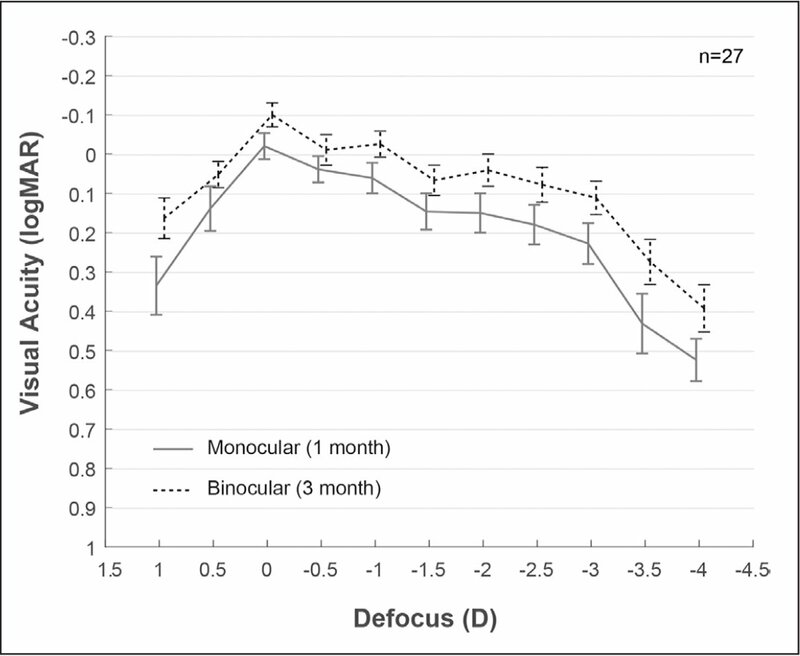 Figure 3 shows the monocular and binocular defocus curves obtained at 1 and 3 months, respectively, for the 27 patients who completed the study. 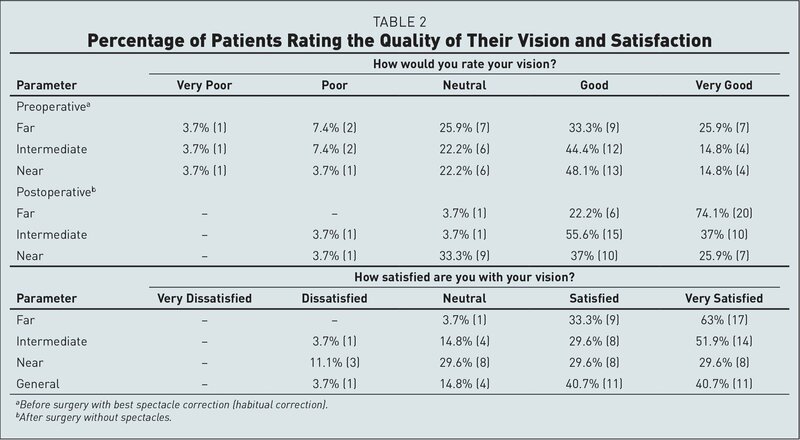 Of the 27 patients, 81.4% were satisfied or very satisfied with their general vision and the satisfaction at a particular range of vision decreased from far to near as shown in Table 2. 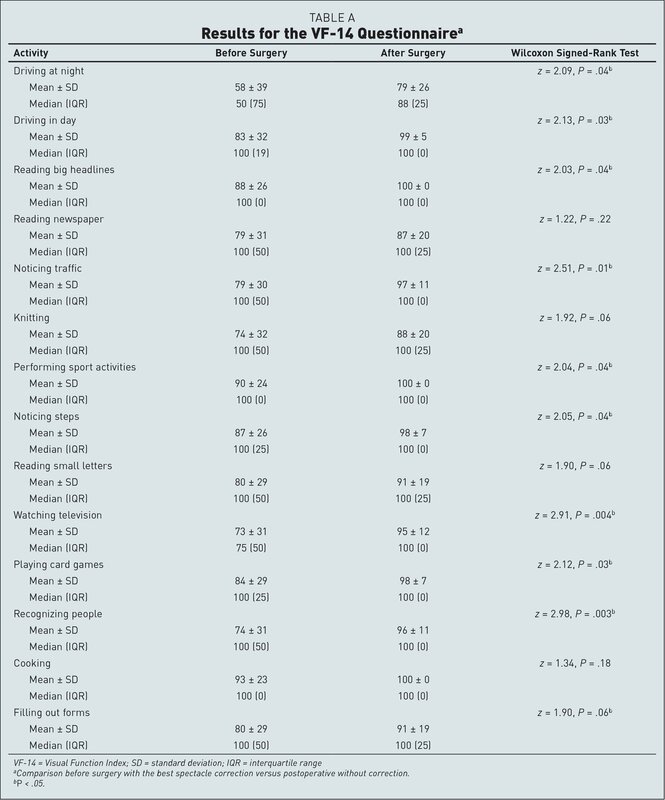 All of the tasks included in the VF-14 questionnaire improved significantly after surgery in comparison to preoperatively with best correction (Table A, available in the online version of this article), with the exception of reading the newspaper, knitting, reading small letters, and cooking, which improved but not significantly (P > .05). The total improvement increased from 81.48 ± 30 (100 ) preoperatively to 94.82 ± 14 (100 ) at 3 months postoperatively (z = 7.33, P < .0005). 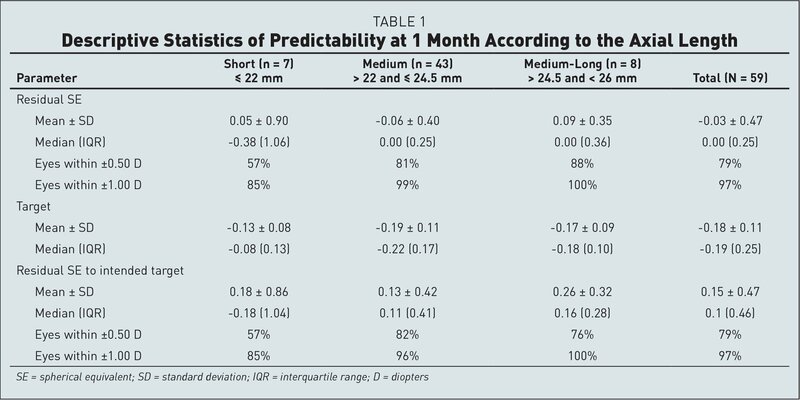 This prospective study introduces the monocular results at 1 month and binocular results at 3 months of a new low addition trifocal IOL (Versario3F). Despite several studies having reported results with trifocal IOLs, few included a complete set of efficacy results at the three main distances of far, intermediate, and near for both corrected and uncorrected visual acuity. We identified seven studies that contain this set of measurements (Table 3). The UDVA varied from −0.03 to 0.17 logMAR and the CDVA from −0.05 to 0.01 logMAR in these trifocal IOL studies. Our results were 0.02 logMAR for UDVA and −0.05 logMAR for CDVA, which means a visual performance at the upper range in comparison to the retrieved studies. On the other hand, DCIVA ranged from 0.04 to 0.39 logMAR in Table 3 and our result was in the middle of this range (0.18 logMAR). Finally, our DCNVA was 0.25 logMAR, closer to the 0.21 logMAR of the Acriva Reviol (VSY Biotechnology, Amsterdam, the Netherlands), which has the same addition as the Versario3F IOL. The visual acuity defocus curve in our study showed the clinical behavior of the Versario3F as a trifocal extended depth of focus IOL because of the progressive decrease of visual acuity from far to near, a concept that has been previously used for other low addition trifocal IOLs such as the Acriva Reviol.18 However, the performance was greater at near than that reported by extended depth of focus lenses such as the Symfony,28 for which the DCNVA has been reported to be 0.33 ± 0.10 logMAR, or the AT Lara29 with a DCNVA of 0.30 ± 0.08 logMAR. Sixty-three percent of the patients were very satisfied with far vision in our study, a percentage higher than that reported for the AT Lisa Tri of 51.5% at 3 months,11 but satisfaction percentages at far distance were similar for the accumulated percentage of satisfied and very satisfied eyes at 96.3% for the Versario3F and 94.2% for the AT Lisa Tri.11 The satisfaction was slightly lower at intermediate for the Versario3F than that reported for the AT Lisa Tri (81.5% vs 93.2%) and the differences were increased at near with 59.2% for the Versario3F and 83.5% for the AT Lisa Tri. Regarding general satisfaction, 81.4% were satisfied or very satisfied. Other authors have reported general satisfaction of 96.6% for the PanOptix5 and 92% for the AT Lisa Tri,34 but differentiation between ranges of vision was not performed as in our study, the study by Mendicute et al.,11 or the study by Alío et al.,35 who reported no significant differences in satisfaction between bifocal and trifocal IOLs at the three distances. A limitation of our study is that we forgot to include a question related to the spectacle independence in the protocol and this is a relevant concept to capture for presbyopia-correcting IOLs. The surgery with implantation of a Versario3F IOL was a safe procedure that significantly improved the performance in several tasks diminished by the cataract progression, especially in the case of driving at night. The efficacy, predictability, and general satisfaction were similar to those obtained with other trifocal IOLs, with the main difference of prioritizing far distance vision versus near vision. These clinical results suggest that Versario3F IOL can be classified in between extended depth of focus lenses and medium-high addition trifocal IOLs and might be recommended to patients with long reading distances who prioritize their far vision. Preoperative patient counseling plays a role in setting patient expectations with the Versario3F, as with other multifocal IOLs. ISO 10938:2016. Ophthalmic optics-chart displays for visual acuity measurement-printed, projected and electronic. https://www.iso.org/standard/63691.html. Published October 2010. Sullivan LM. Power and sample size determination. In: Riegelman R, ed. Essentials of Biostatistics in Public Health, 2nd ed. Burlington, MA: Jones & Bartlett Publishers; 2012:171–192. Rodriguez-Vallejo M. Refractive Analysis v.1.0.0. A Matlab toolbox for the analysis of refractive results in anterior segment surgery. http://test-eye.com/index.php/en/refractive-analysis. Published 2018. How satisfied are you with your vision? From the Department of Ophthalmology (Qvision), Vithas Virgen del Mar Hospital, Almería, Spain (JF, MR-V, JM, AT); the Department of Ophthalmology, Torrecárdenas Hospital Complex, Almería, Spain (JF); the Department of Optics, Pharmacology and Anatomy, University of Alicante, Alicante, Spain (DPP); and the Department of Ophthalmology, Vithas Medimar International Hospital, Alicante, Spain (DPP). Dr. Fernández received a grant from Bausch & Lomb, Inc. for conducting this research. The remaining authors have no financial or proprietary interest in the materials presented herein.